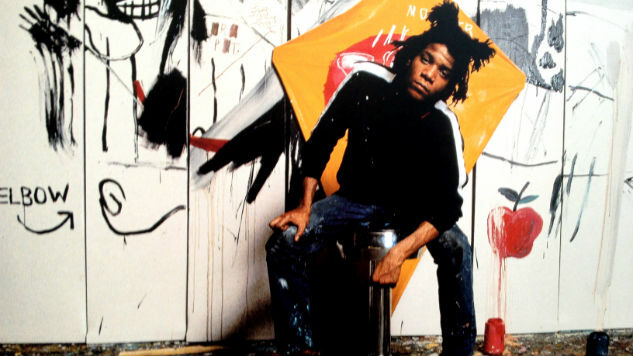 Stacey Bendet, the CEO and creative director of fashion label alice + olivia, has announced that the late graffiti and neo-expressionist artist Jean-Michel Basquiat, through his estate, is the brand’s latest partner for the capsule collection. Proceeds will support the CFDA Initiative, a program that identifies and promotes young talent in the world of fashion design. Alongside the CFDA Initiative, alice + olivia collaborates with a new artist each year to create a timely, modern capsule collection in celebration of young fashion talent all across America. Last year, the brand partnered with artist Domingo Zapata, a Spanish-American painter and graphic artist who hand-painted designs for a ball gown, full-length skirt, and custom two-piece skirt and bustier set, all of which was auctioned off on Paddle8 and benefited the CFDA cause. The new collection combines notable elements of Basquiat’s art, such as the golden crown motif and heavy street-art influences, with the label’s trademark playful, feminine spin. Bendet cites legendary pieces like “Panel of Experts” (1982), “Beat Bop” (1983) and “Replicas” (1983), among others, as particular sources of inspiration for the forthcoming collection, touches of which can be observed throughout the collection of clothing, accessories and gifts. Bendet has paid homage to the great artist by adding a modern twist with the incorporation of intricate, dimensional details, like beadwork and embroidery, to his iconic works. The Resort 2017 collection, which hits stores and online shops in November, will be available for purchase at all alice + olivia by Stacey Bendet stores, their website and other retail partners, with half of all proceeds from the designated items donated to the CFDA. The brand teamed up with Ruffino Wine and SVEDKA Vodka for their launch party.